In 1870, the four Perry sisters of Binghamton, New York make a pact to find some way of financially supporting their nearly blind mother and their father, who suffers from consumption. They decide to answer ads from men out West looking for wives in the hope that their new lifestyles will enable them to help their parents back East. Book 1: Mail Order Bride Sarah – Sarah, the eldest and a widow, will be the first to respond to a personal ad in San Francisco’s Matrimonial News—though as far as she’s concerned, her one true love died fighting in the war five years ago. After weeks of combing through ads, Sarah is drawn to thirty-six-year-old homesteader and widower William J. Lindsay’s ad for a “calm, good-natured lass from the East to help build his home and hearth.” As she and William begin their correspondence, she finds herself having feelings she’d thought had died forever. Will feelings of betrayal get in the way of her blossoming love for William, or will she follow that love out West? 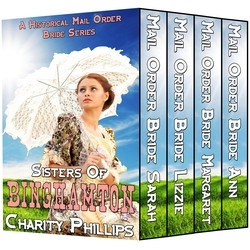 Book 2: Mail Order Bride Lizzie – It’s spring in 1871, and seventeen year old Lizzie Perry is in love with a shop boy named Henry. She must uphold her end of the pact she made with her sisters, however, so, begrudgingly, Lizzie begins corresponding with Fred, a twenty-five-year-old sheep rancher from Cheyenne, Wyoming, but maintains her relationship with Henry as well. Things change when Lizzie realizes just how impoverished her ailing parents really are. In an effort to help, she resolves to head out west and get to know Fred, though she tells him she won’t marry him until she feels she knows him. Once in Wyoming, Lizzie pines for the city, her shop boy, and her general sheep-free lifestyle back in Binghamton. Is Lizzie doomed to pine forever, or will she give this dashing rancher a chance? Book 3: Mail Order Bride Margaret – In the spring of 1872, young Margaret Perry is surprised to receive a letter from John Bartly, the Dakota farmer who she had written to well over a year ago. Mr. Bartly had placed an advertisement in Matrimonial News seeking a bride and caretaker for his children following the unfortunate passing of his beloved wife. Margaret hates the thought of leaving Janie and Thomas, the children to whom she has served as a governess for seven years, but she must accept Mr. Bartly’s proposal to come West as her father’s struggle with consumption continues to worsen, and her mother’s sight has completely deteriorated, leaving them both unable to work. Her one comfort is that Mr. Bartly has two children. When she arrives In Dakota, however, Margaret finds Mr. Bartly to be just as cold in person as he was in his letters–and his children are just as demonic as Janie and Thomas are angelic. Will Margaret find the key to tame Mr. Bartly and his children, or will she be resigned to end her month-long trial at Bartly Farm before she has the chance to have a glimpse of the future they could share? Book 4: Mail Order Bride Ann – Ann Perry has always dreamed of a more independent future. For the past two years, Ann has been studying to become a teacher, attending college by correspondence in secret. Now her professor says that she must come to New York City to practice teaching children in person in order to earn her degree. As she works out the details of how she’ll break the news to her parents, Ann keeps her mother happy by responding to the ad of Samuel Burnham, a wealthy San Francisco reporter. Sam seems like a charming fellow, but Ann can’t ignore her strong desire to continue on with her studies. Will she tell her parents about her plans for New York City, or will she follow her growing feelings toward Sam out west?